It is not easy to for any nation to provide adequate food for the millions of people, living within the borders of the country. Only a nation that has a robust agricultural base will be able to produce enough food grains, India is such an agricultural nation that depends majorly on crop production. Thankfully, the central government has designed and implemented several schemes, which target the betterment of agricultural workers. 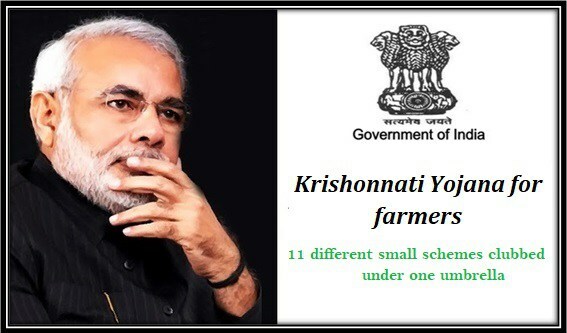 Krishonnati Yojana is one such umbrella scheme includes several agrarian programs. Betterment of agricultural base – Only with the extension, implementation and proper monitoring of these 11 schemes, it will be possible to develop the overall agricultural condition of the nation and status of farmers as well. Doubling of farmers’ earnings – The central already has the mission of doubling the net income of all agricultural labors by the end of 2022. The implementation of these missions under the Krishonnati Yojana will help to make this dream a reality. Appropriate agricultural infrastructure – Proper agricultural infrastructure is also necessary for developing the agrarian condition. These missions under the umbrella scheme will offer the required foundation. Adequate market for sale of produce – Production of crops must be adequately supported by markets, where farmers will be able to sell the produce. The development of the umbrella mission makes this possible. Mission for Integrated Development of Horticulture – The central government has allocated Rs. 7533.04 crore in this sector for development of horticulture based productions and national nutritional safety. National Food Security Mission and National Mission on Oil Seeds and Oil Palm – This sector will get Rs. 6893.38 crore. Selected areas will get special attention to increase rice, wheat, coarse cereals, commercial crops and pulses production. Increased production of vegetable oils in the nation will reduce dependency on imported oils. Individual farm development and soil fertility will also be restored. National Mission for Sustainable Agriculture – It has been allotted a sum of Rs. 3980.82 crore and will target the development of agro ecology, apart from soil health development and use of technology in the field of resource conservation. Sub-Mission on Seeds and Planting Material – It will get Rs. 920.6 crore and will work towards all developments, associated with seed production, apart from better storage. Quality seeds will yield better crops. Sub-Mission on Agricultural Mechanization – The government has granted Rs. 3250 crore for the development of farm mechanization. Apart from big farmers, small and marginal agricultural workers will also get access to agricultural machines, power supply, and services of farm testing centers. Sub Mission on Plant Protection and Plan Quarantine – It will receive a grant of Rs. 1022.67 crore. The scheme mainly deals with crop protection against animal and rodent attacks. It will also strive towards increasing export of agricultural products. Integrated Scheme on Agriculture Census, Economics and Statistics – Rs. 730.58 crore has been allotted for the development of this sub-scheme. This scheme will work on acquiring, analyzing and researching of crop production data. It will also research on several farming aspects, cultivation costs, and agricultural census to create a comprehensive hierarchical information system. Integrated Scheme on Agricultural Cooperation – An amount of Rs. 1902.636 crore has been allotted towards providing economic assistance for betterment of cultivation, crop harvesting, safekeeping of the produce and proper record keeping under this scheme. Integrated Scheme on Agricultural Marketing – It has been given Rs. 3863.93 crore for development of adequate marketing conditions. Agri-marketing development along with creation of singular web based marketing platforms and centralized marketing information system is the main aim of this project. National e-Governance Plan – A whopping sum of Rs. 211.06 crore has been allotted for this scheme. Both central and state authorities have several ICT initiatives. The main task of this scheme is to streamline these initiatives and bring about holistic development. In the meeting, it was decided that the central government will allot around 33,269.976 crore towards the extension of the agricultural schemes. The amount will be divided accordingly for the better implementation and monitoring of the individual yojanas.